There was good news last night for ABC, none (again) for FOX. DEMOGRAPHIC DETAIL: For each broadcast program (or hour segment) Wednesday, the chart below displays preliminary key advertiser demographics (adult 18-34, 18-49 and 25-54 ratings), audience skews (women 18-49, men 18-49 and adults 50+ shares) and total viewership (thousands of people over the age of 2). ABC: The debut of BLACK-ISH went exactly as ABC hoped, with a 3.3 rating in 18-49s that was close behind MODERN FAMILY’s 3.7 season premiere. Although BLACK-ISH was just slightly above the 3.2 that SUPER FUN NIGHT had in the 9:30PM slot a year ago, it retained a much higher proportion of its lead-in, since MODERN FAMILY was at 4.2 that night. Also, although the older audience is of less importance to the networks, it’s worth noting that while SUPER FUN NIGHT lost 3M total viewers from MODERN FAMILY, BLACK-ISH actually had slightly more total viewers than its mighty lead-in. In other good news, THE GOLDBERGS proved itself perfectly compatible with new lead-in THE MIDDLE, rising from MIDDLE’s 2.1 (down 0.4 from last year’s premiere) to 2.3. Again, while that was just above last year’s BACK IN THE GAME debut at 2.2, it was a much better match in the context of its lead-in, rising 0.2 instead of falling 0.3. (GOLDBERGS was considerably down from last season’s 3.1 premiere, but that followed the massive launch of AGENTS OF SHIELD. It was nicely up from May’s 1.5 season finale.) NASHVILLE is what it is, down half a point from last year’s premiere to 1.5. FOX: RED BAND SOCIETY fell 30% from last week’s preview airing to 1.0, putting it in a state of intensive care worse than its characters’. HELL’S KITCHEN slipped 0.1 to 1.3. NBC: THE MYSTERIES OF LAURA lost half a point from last week’s out-of-timeslot preview to 1.5, down 0.3 from last year’s REVOLUTION season premiere. 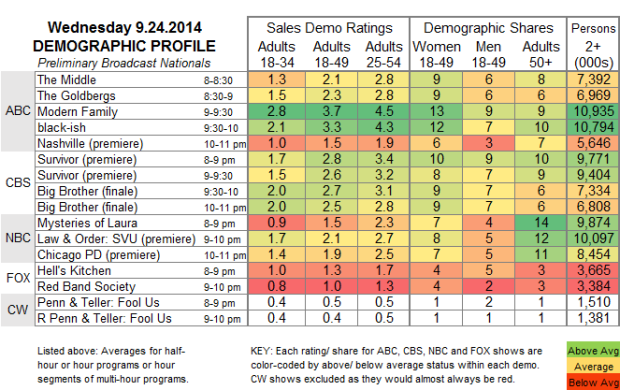 Remarkably, LAURA skewed older than SVU, with the highest number of viewers 50+ of any show on any network all night. SVU itself, at 2.1, was down 0.6 from last year’s special 2-hour premiere (although up 0.1 from the next week’s rating). CHICAGO PD was at 1.9, far above the 1.3 launch last fall of IRONSIDE. CBS: The 90-minute season premiere of SURVIVOR was up 0.3 from 2013 at 2.7. The 90-minute BIG BROTHER season finale was at 2.6, up 0.4 from last week’s 8PM airing. CW: The season finale of PENN & TELLER: FOOL US held at 0.5. Tonight brings the arrival of Shonda Rhimes Night on ABC, with the series premiere of HOW TO GET AWAY WITH MURDER following season premieres of GREY’S ANATOMY and SCANDAL. Also making their first appearances for the season are BONES on FOX and PARENTHOOD on NBC. COMPARISONS TO SIMILAR NIGHTS: Preliminary adult 18-49 ratings for Wednesday, the same night last year and same night last week. CABLE RATINGS: Come back this afternoon for detailed demographic ratings for top Wednesday cable programs.